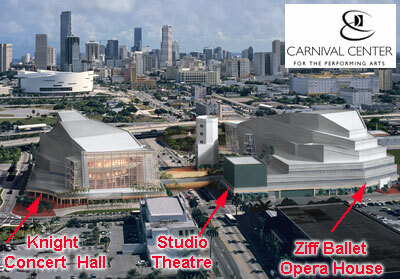 Miami Beach 411 : Arts : Theatres : Search results for Carnival Center in Miami Beach, FL : For tickets call 1-305-949-6722. This page allows you to buy tickets, find directions, and locate contact information for the Carnival Center for the Performing Arts in Miami, FL. Should you choose to call the theatre, please mention that you found them at MiamiBeach411.com. The Carnival Center offers compelling performances, events and educational offerings of exceptional quality and artistic excellence. The performing arts complex consists of 3 main performance spaces: the Knight Concert Hall, Ziff Ballet Opera House, and the Studio Theater. • Starting going SOUTH on COLLINS AVE to 5TH ST.
• Turn RIGHT (West) on 5TH ST.
• 5TH ST / FL-A1A W becomes US-41 W / MACARTHUR CSWY. • Take the NE 13TH ST exit- EXIT 2- toward US-1. • Stay STRAIGHT to go onto NE 13TH ST.
• Turn SLIGHT RIGHT onto US-1 N / BISCAYNE BLVD. Snooping around the Carnival Center from the nosebleed section to center stage. Carnival Center in Miami Beach 411's Art section.